The Motorola SL3500e offers the best of the SL series combined with the technology inside the XPR3500 radio. 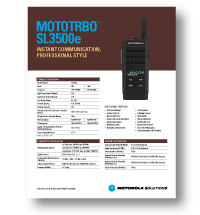 The Motorola SL 3500e combines the award-winning design of the best-selling, SL300, with the power and technology of their state-of-the-art XPR series. This radio has everything your business needs to thrive, not only in today's business world but well into the future. This feature-rich radio has it all: Bluetooth Capabilities, WiFi Technology & the NEW two-line OLED screen, exclusive only to this radio. The SL 3500e is designed to deliver outstanding performance while giving you and your team a clean, modern, professional look. This concept not only runs through the physical design of the radio, but through it's ability to use wireless accessories through Bluetooth capabilities; keeping you wire-free and providing discreet communications. Bluetooth requires HKVN4412 option key that is sold separately. IT and Communication Managers waste valuable time when they have to perform software updates on individual radios, but with integrated WiFi, an entire fleet of SL3500e's can be programmed over-the-air, all at the same time. Eliminating the need to pull radios out of service so for updates, and saving valuable time for your managers and employees. Since this radio is equipped with MOTOTRBO™ technology, it boasts all the perks that come with the top-of-the-line Motorola series. This includes compatibility with MOTOTRBO™ two-way radio repeaters and systems. This means when your radio system needs to grow, the SL3500e can handle it. 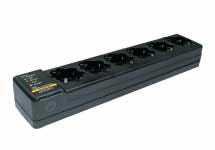 It is designed to scale up from Single Site or IP Site Connect, to Capacity Plus; letting you build your system as you need it, and in a more economical way. 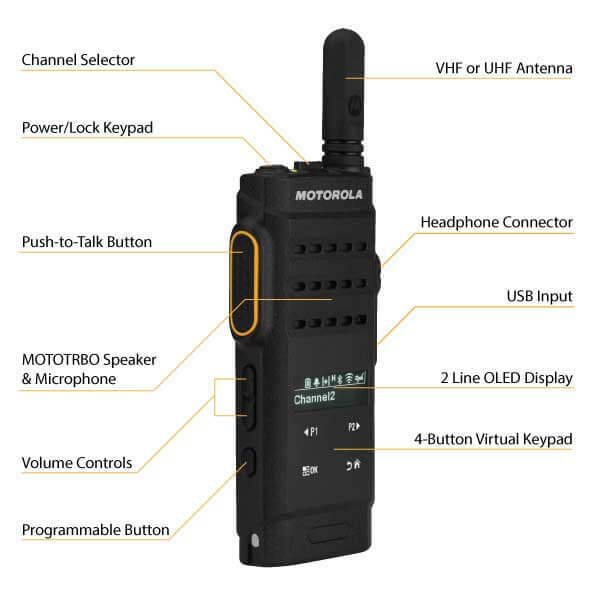 The MOTOTRBO™ technology powering this radio gives it instant push-to-talk communication capabilities, not only with other two-way radios but also with cellular devices, computers, and other equipment when used with WAVE 3rd-party applications. WAVE technology helps to bridge gaps between communication devices so your team has push-to-talk capabilities, no matter what type of device they prefer to use, letting them get work done faster and more efficiently. With it's sleek design, digital technology and system scalability, the future of radio is here with the Motorola SL3500e. This 6-unit charger lets you build a charging station for your SL3500e's - giving you a more organized & reliable two-way radio fleet. 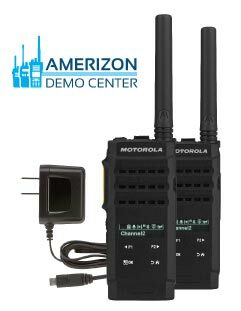 Our demo's provide you everything you need to test the range, clarity, and battery life of the new Motorola SL3500e radio.